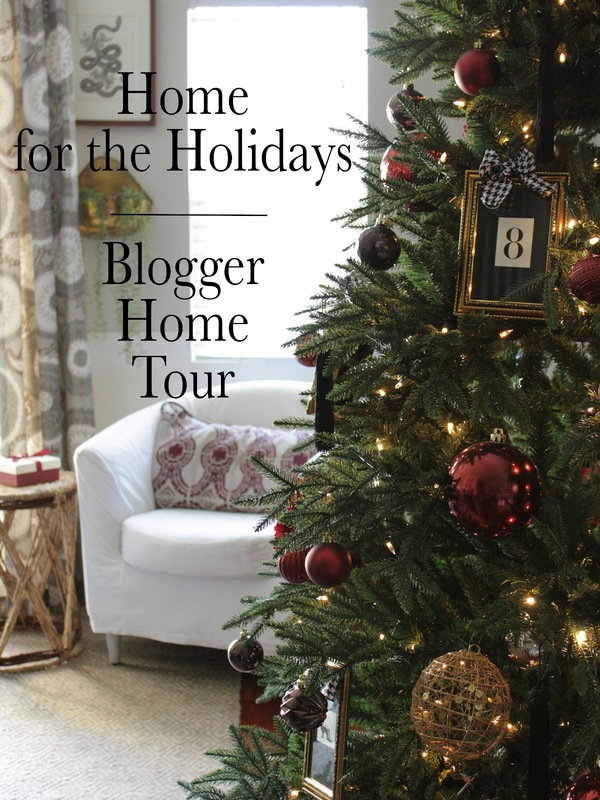 Welcome to "Home for the Holidays" blog tour! You're probably coming from one of my FAVORITE bloggers, Gloribell's blog, "I Don't Know How She Does It" and I am happy you decided to stop by! Don't you just love all the warm woods and neutral decor she uses in her home? I'm a big fan! 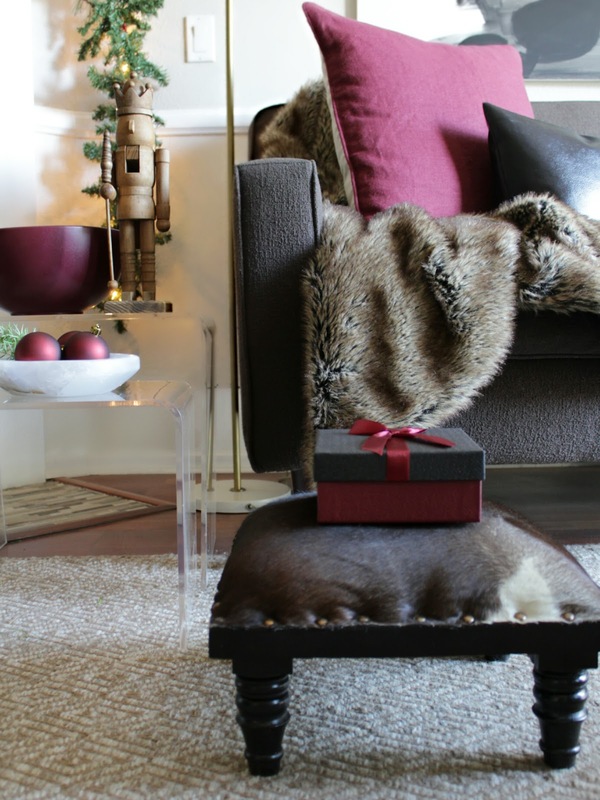 I'm going to show you how I updated my living room for Christmas. I wanted to incorporate deep, moody colors like black combined with and warm merlot colors. (Mmmm...merlot...) I had in mind to do lots of red this year, but I chose to go with the wine color instead because the color scheme can carry me through winter, after Christmas is over. (Keep in mind that we are technically still in Fall until December 21 so I need my decor to last me a while!) Anyway, let's get started! *This post is sponsored by King of Christmas. Although I have been compensated, all opinions are my own. No, seriously. As soon as you walk in to my house, you get a glimpse of my beautiful King Of Christmas tree. I wanted to create a sort of "entrance" to my home where things unfold as you walk in. #drama. I wish I had a foyer! I was debating whether to go real or faux this year with my tree. When King of Christmas wanted to sponsor our tour, I immediately made my mind up LOL. I have seen their trees before and they are STUNNING. I got the 7 foot Delaware Spruce. I felt that tree looked the most realistic, and let me tell you, it looks GREAT. It's so bushy and the branches are nice and long. I recently was comparing it to other trees I have seen in the market and the difference is in the needles of the trees. My King of Christmas tree has two different types of faux needles which gives the tree more texture and depth, making it look more realistic. ALSO: YOU HAVE A CHANCE TO WIN YOUR OWN KING OF CHRISTMAS TREE! YES, YOU READ RIGHT! YOUR OWN KING OF CHRISTMAS TREE! Each comment (one per blog) qualifies as an entry. So, the more blogs you comment on in our tour the more entries for you. Also, if you subscribe to our blogs each subscription gives you two more entries. This giveaway is for US residents and you must be at least 18 years old. This King of Christmas tree giveaway ends on December 11th at 8:00 pm Pacific Standard Time. The winner will be announced that week! Good luck! OK, so back to me. For my tree decor, I added some shatter-proof ornaments (because kids and dog) in the wine color combined with some gold and brown ones. They came in a pack and you can order them HERE. After I was done adding the ornaments, I felt my tree looked to circle-y. To many spheres LOL. So I broke it up by adding dollar store frames with vintage style gift tags that I cut to size. You can find similar gift tags HERE. Threw in some bows , some black tassels AND some gorgeous faux flowers! I think the flowers were my favorite part of the tree! You can find the flowers HERE. I'll keep the rest of my tour short and sweet. After you are done here, go check out my friends and she how they decked the halls this holiday. At the end of this post, I have included a list of all participating bloggers for your viewing pleasure. I hope you enjoyed my mini - tour! 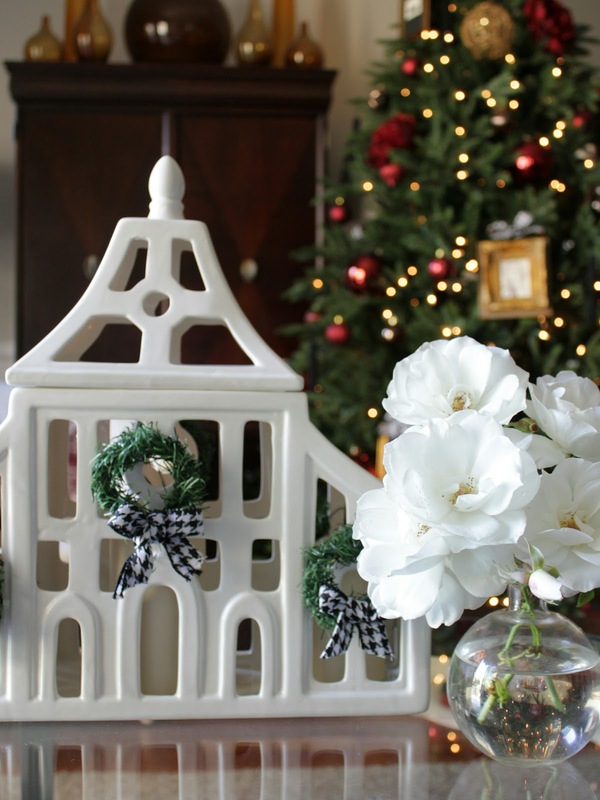 Stay tuned: In a couple of weeks I will be sharing my dining room decked out for the holidays! If you want to know when I post, simply subscribe to this blog! And don't forget to leave a comment for your chance to win your own King Of Christmas tree! Now be sure to visit another favorite of mine: Joan from 2 Ladies & A Chair! Her place is super stylish and fun. I'm sure you'll love it! Here is a list of everyone who is participating in this blog hop. How fun will it be to see everyone's King of Christmas tree! Wow this is AMAZING Oscar!! I love the frames in the tree!! So unique and creative! I am loving the deep red as well, it is very elegant! Thanks Lacey! Whats even better is that they are from Dollar Tree! Love the color you chose for your decor. The vintage tags are amazing and are what gives character to the tree. Fabulous job dear friend! Thanks so much, Gloribell. I took a peek at your tour and wow, I can't wait to dive in and see it! omg oscar, this is FABULOUS me gusta todo todo. creeme que eres muy talentoso. quiero que me decores mi arbol para el siguiente ano. Amiga, that's a huge compliment coming from you! Muchas gracias! Hi Julie! Thanks so much for your kind words my friend!can't wait to visit your place! Aww happy you like it! Thanks so much , Sam! Hi Kathy! Thanks so much ! Those picture frames are such a unique idea! Great masculine yet rather glam space. Some great decorating ideas, thanks for sharing and thanks for the giveaway! Classic and elegant. Good job. Your decor is so elegant! I especially love the black and white houndstooth. I would have never thought to decorate with that print but it's so lovely! I'll need to remember that for next year! Wow,amazing! So simple, yet so elegant. We have a small space, but I can see how tiny details can really elevate it. Absolutely, Luz! My home isn't huge but the good thing is sometimes it only takes a few elements to make a big impact! Drama!!! Definitely! I am in love with your color scheme. I especially love your frame ornaments on the tree! I'm taking notes...Beautiful! OK Oscar, you've done it again! My jaw is on the floor! I absolutely love the theme and color palette you chose. Everything is so chic and spectacular! 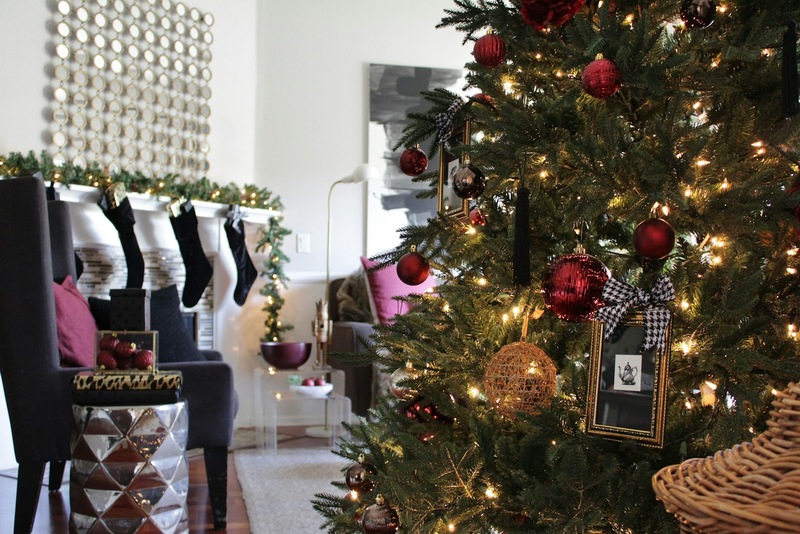 I love that frame with the ribbon hung on the tree! The wine and blacks and that leopard wrapping are just exquisite! I'm so impressed and I so enjoyed this tour of your home! Great job my friend!!! Merry Christmas to you and your darling family! Yours was the first tour I've seen that featured nutcrackers! I have a small collection so that was a thrill to see. thank you! Oscar, you never cease to amaze me! I LOVE the drama you created, and the sophisticated feel of your room. Masculine and chic at the same time - love it! And the framed tags were just the icing on top of that gorgeous tree. Excellent job, my friend! You are such a class act, Oscar! 🙌🏼 Your creativity is unbelievable and how you flawlessly decorated your home for Christmas is magical. Beautiful job Oscar, as always! Your home is beautiful and love your color scheme! You did such a wonderful job! 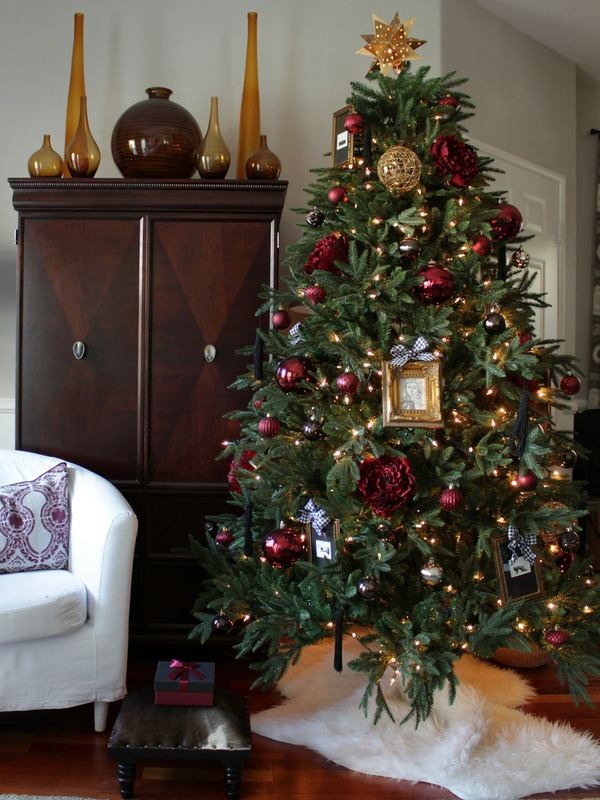 I absolutely LOVE the deep red/Merlot color and can I say, the little frames make the whole tree! I seriously would have never thought to do that - you're so creative! Can't wait to see more of your home on your next tour! Happy Holidays! So creative, masculine, chic, and gorgeous Oscar!! 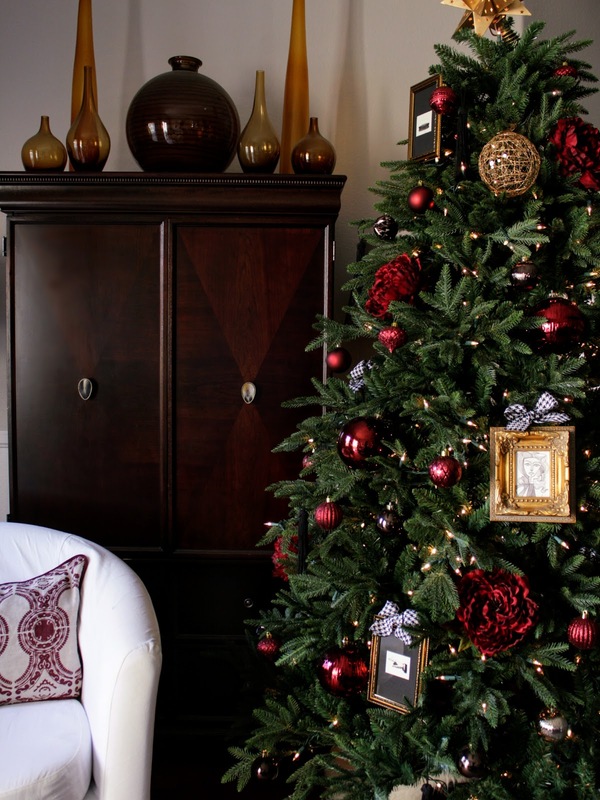 I'm really loving the dark red and love the frames on the tree!! Bravo!! I love the wine color scheme! It is dramatic and elegant all at once. Can't wait to see your dining room! Yep, it's absolutely gorgeous....I love to see your masculine decor. 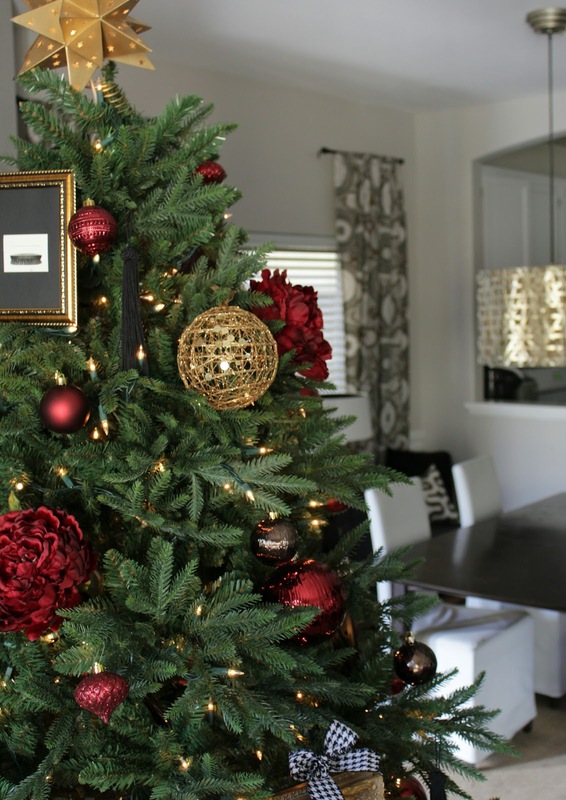 It is sophisticated and very classy...and I love how you added the gold to your tree with the addition of art frames and the black tassels.... great style Oscar! It's all so beautiful, Oscar! Wonderful job creating a warm, welcoming, and stylish space, as always! Bravo! What great holiday decor. I love all your touches of color. Also, your Christmas tree skirt is so natural and placed so beautifully! You always decorate in such a confident and gorgeous style. I love to study every photo and room! Thanks for joining our fun tour! ❤️ The picture frame ornament. Tree looks so realistic! Thanks for sharing! Happy Holidays! What a stunning Christmas home that truly shouts the beauty and joy of the season! Love your style and your ability to have such an expensive look without spending a fortune on things! Beautiful Tree and Christmas decor.